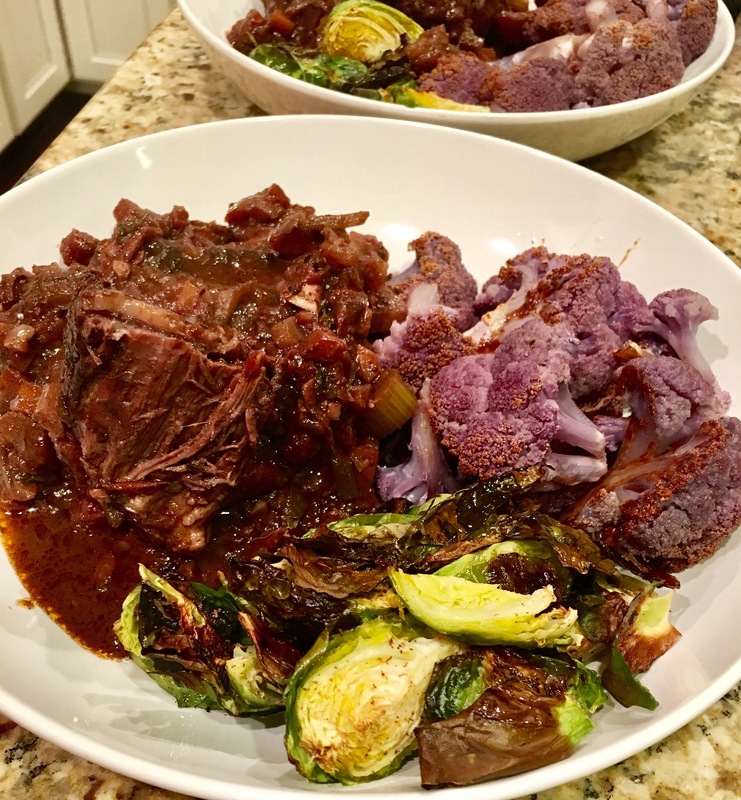 Wine and Chocolate Braised Short Ribs – Eat, Drink, and Go! 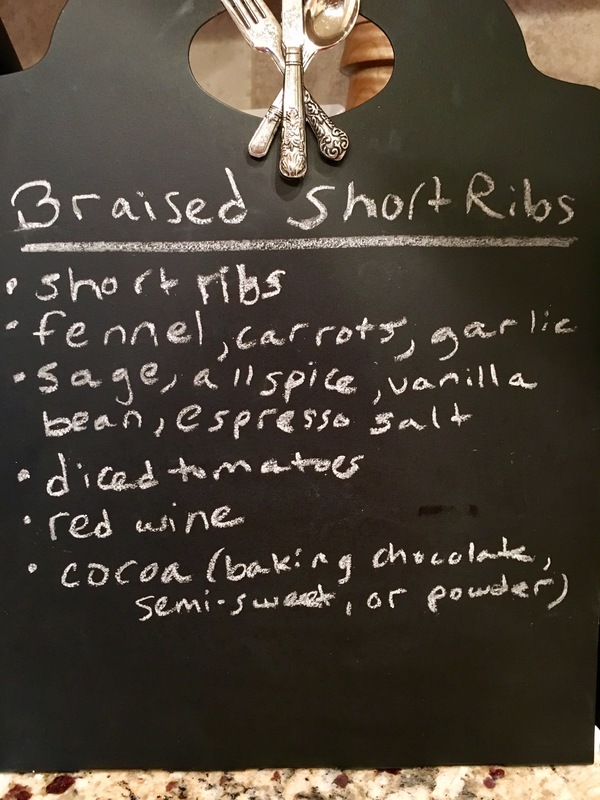 I knew I was going to braise something and short ribs is usually what I gravitate to for that. 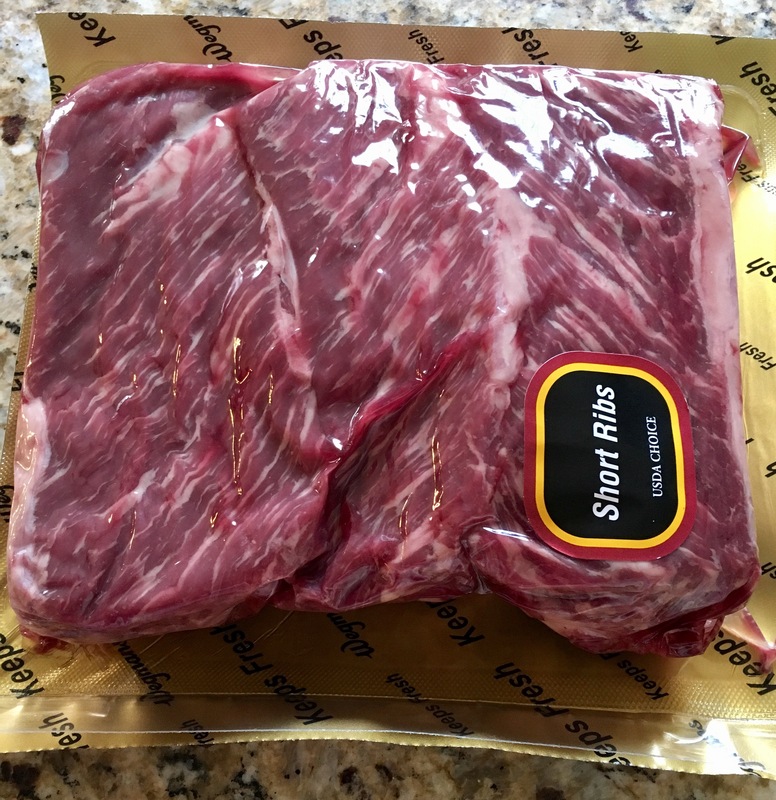 Big fat boneless short ribs. Check. A bottle of red wine that was perfect for it. Check. And an afternoon working at home. Check. 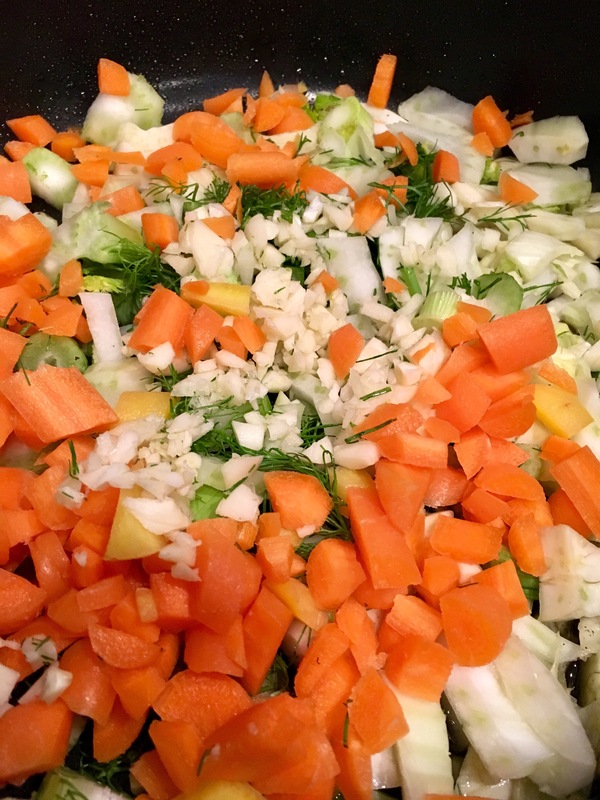 The perfect setting for a warm winter braise! 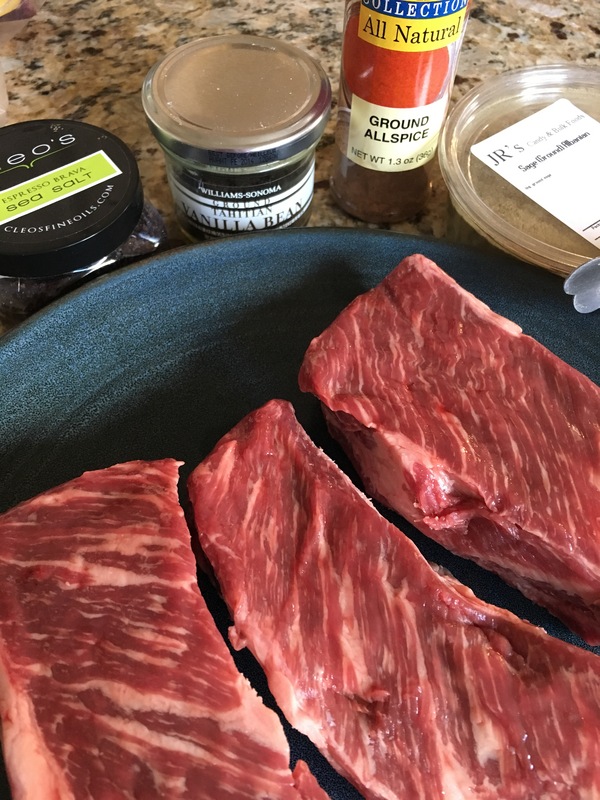 I started with a dry rub on the hunks of meat. 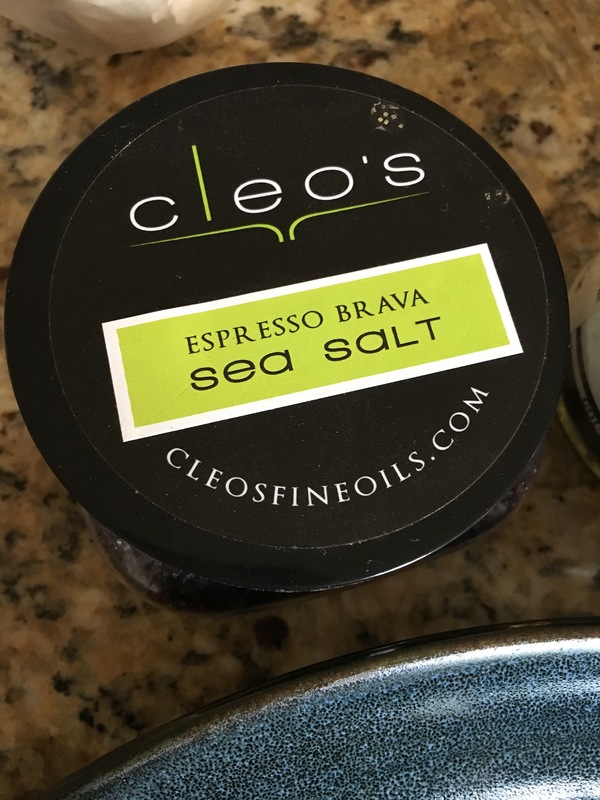 Allspice, sage, vanilla bean, and just a little espresso salt. 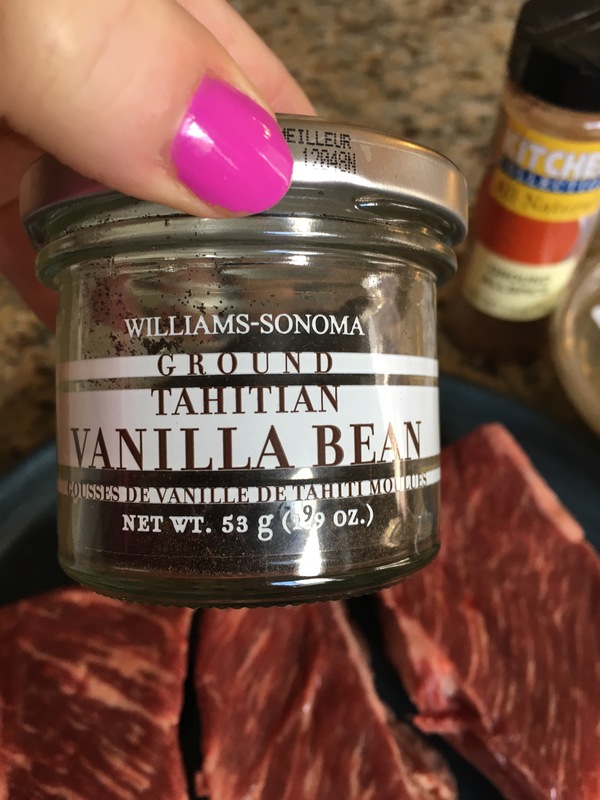 I let the meat marinate in the dry rub for about an hour. Then I got a pot nice and hot with some olive oil to sear in those spices. 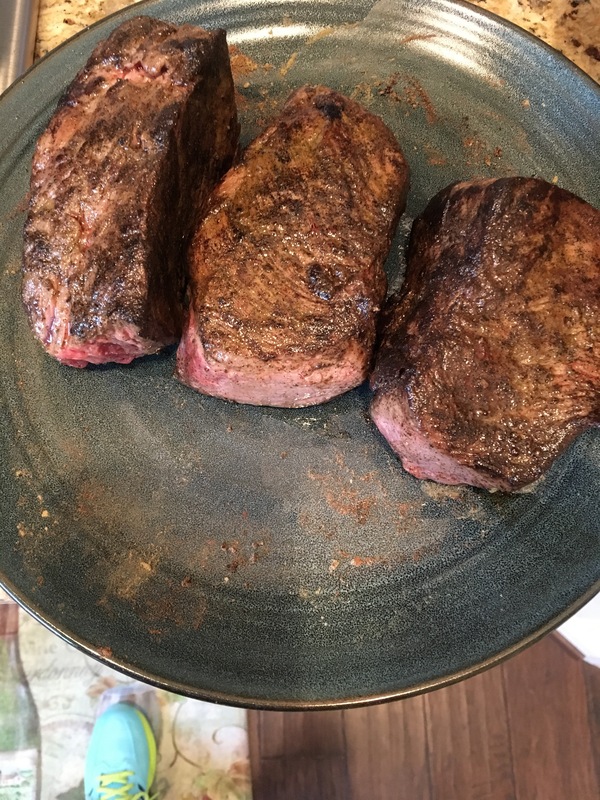 Get a good sear on each side, about two minutes on each. Then remove the meat from the pot and set it aside while you get the base for the braise together. 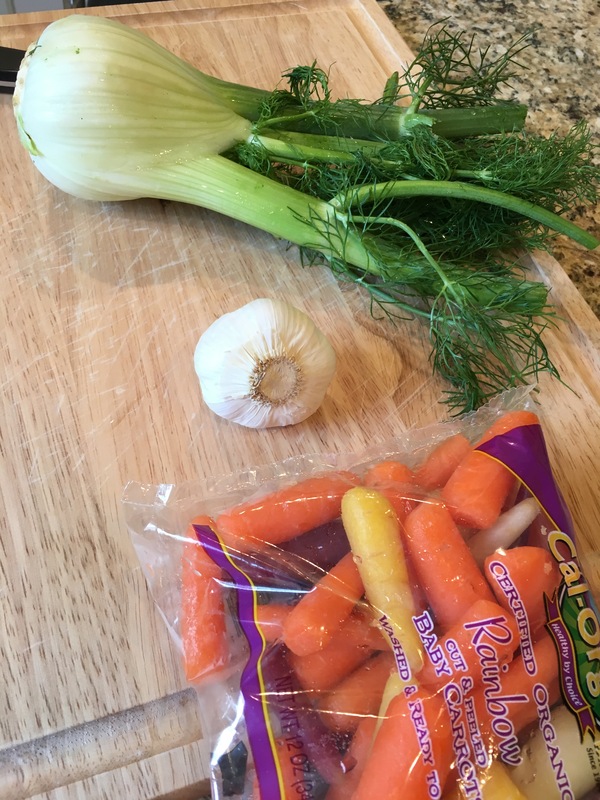 I used fennel (gives soups and braises a really smooth taste), carrots, and garlic. Chop it all up and sautée it in the braising pot. 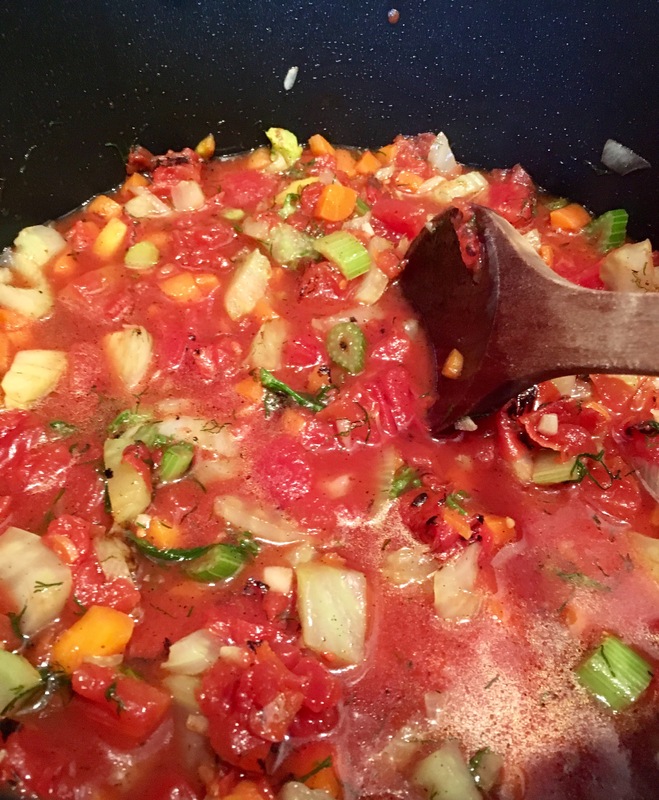 Once the veggies are sautéing for about 10 min (cover for a bit to really sweat them out), then add a can of fire-roasted diced tomatoes. 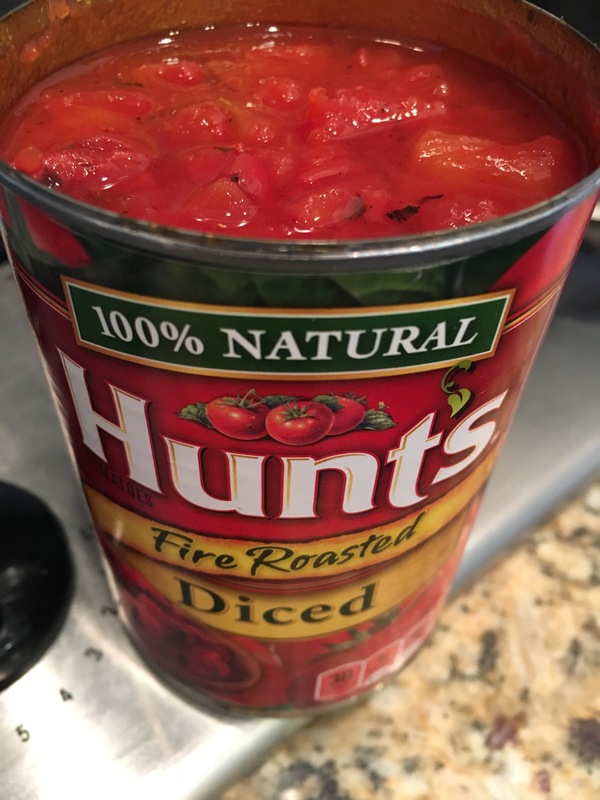 I usually use fresh tomatoes when cooking, but I needed the extra tomato liquid that a can offers, plus half a can of water. Then get this going and get ready to add wine. A lot. Like at least two glasses. Or should I say cups? Taste the wine, cause wine ought? Hehe. Put the meat back in. The liquid for the braise only needs to come just shy of the top of the meat. Cover and let it bubble for a bit. Turn the meat every now and then. 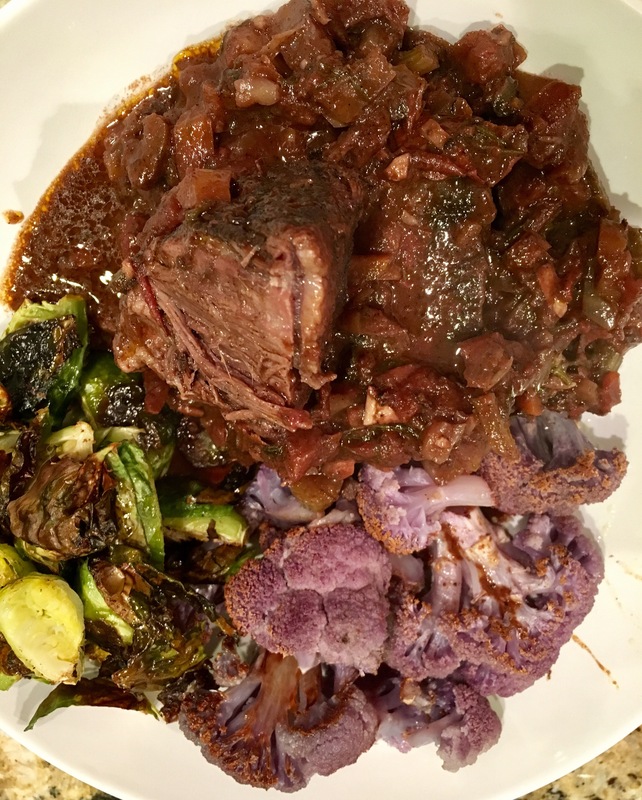 I didn’t even need to season this braise, I just knew it was going to be deep and rich with this nice bottle of Cabernet Sauvignon. Then it was time for chocolate! You can use basically any semi-sweet version. 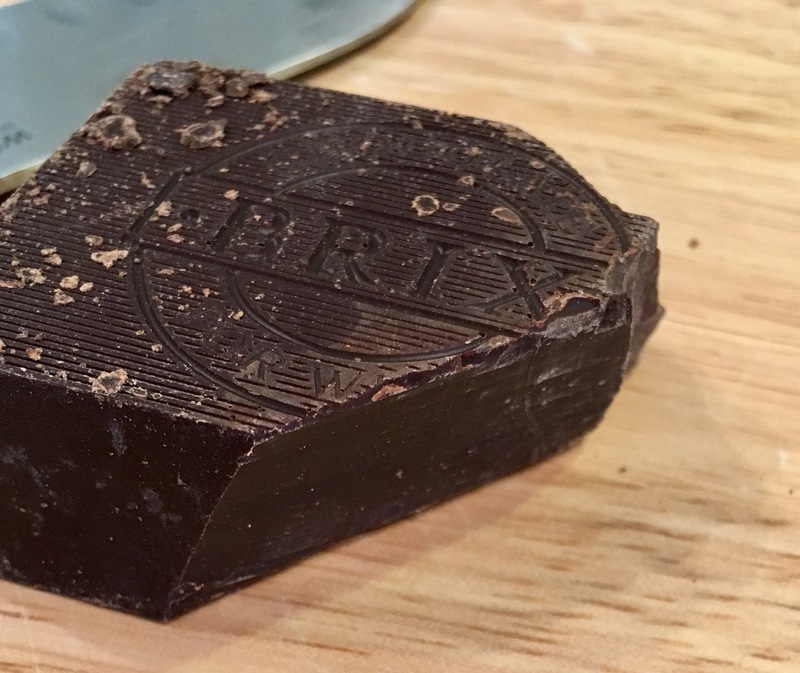 I happened to have a brick of really nice dark chocolate and I just felt like being luxurious. I chopped it all up. 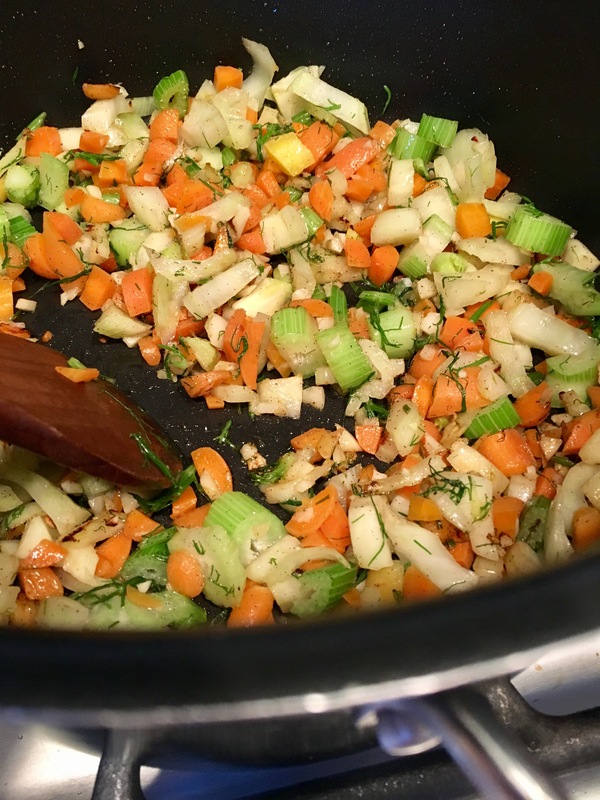 And added it right into the braise. Mmmm. Chocolate. It’s not going to taste like chocolate sauce. 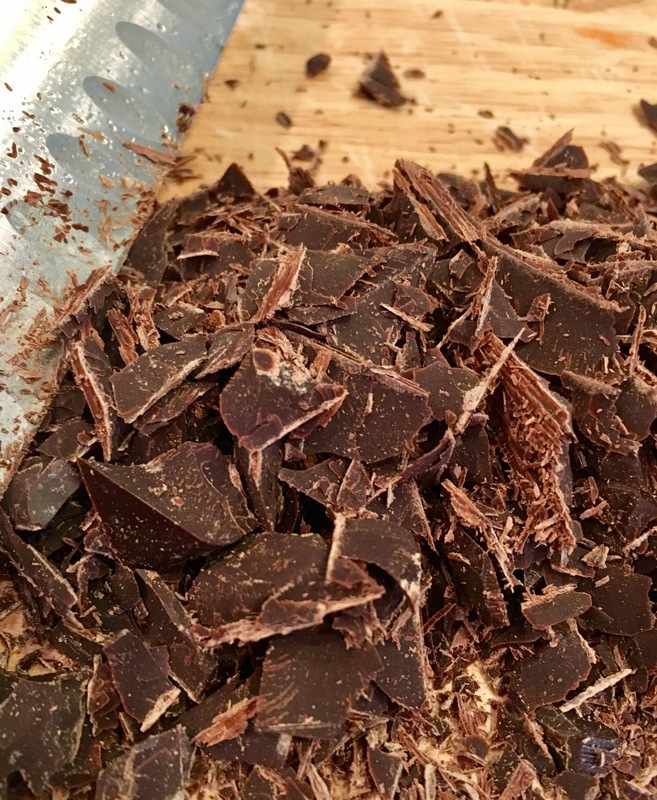 The chocolate actually ends up giving more smell to the braise than chocolate taste, but it works so great to make your braise rich and decadent. 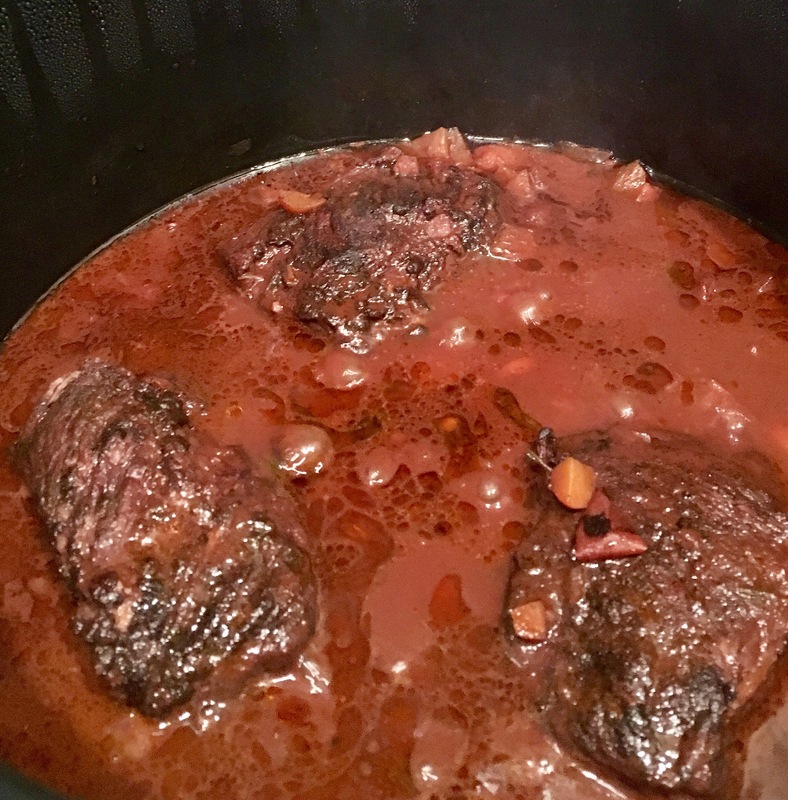 The braising takes about three plus hours. You have to break the meat. Once it breaks, it is fork tender and falls apart. While the braise was finishing (which was so amazingly delicious I was doing shots of the liquid, since there was extra liquid! 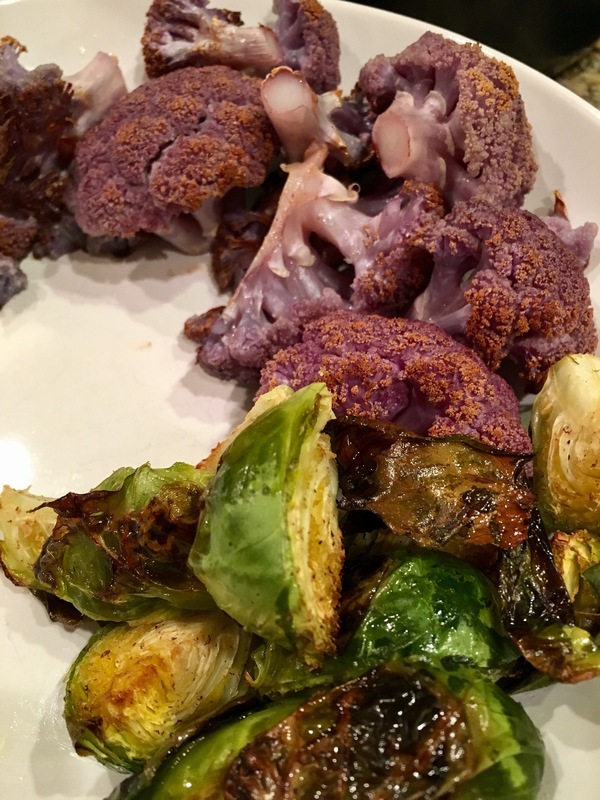 ), I roasted up some purple cauliflower and Brussel sprouts. 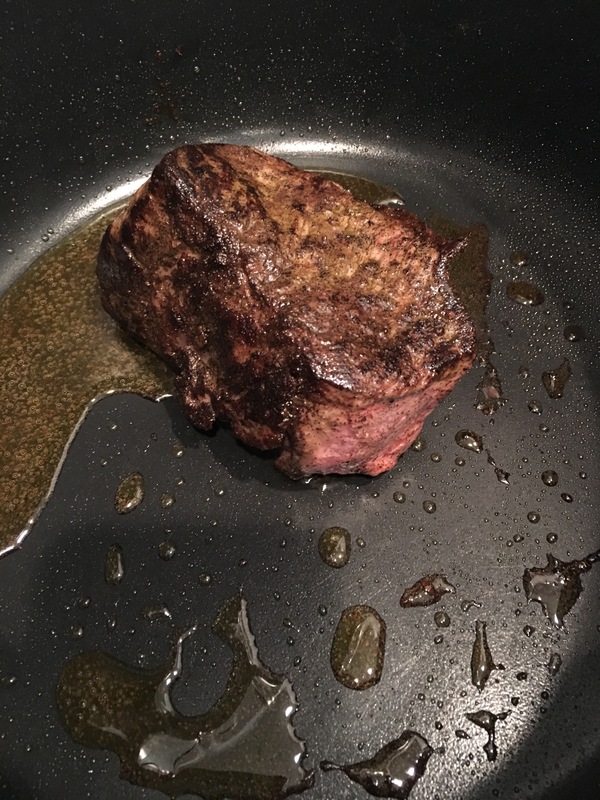 Drizzled with EVOO and added a little truffle salt and ground nutmeg for some spice. I love my little microplaner. Perfect for things like whole nutmeg to grind fresh onto stuff! The braise had the house smelling heavenly. Sometimes I like to go outside and walk back in just to get that hit! The veggies were roasted and time for plating! 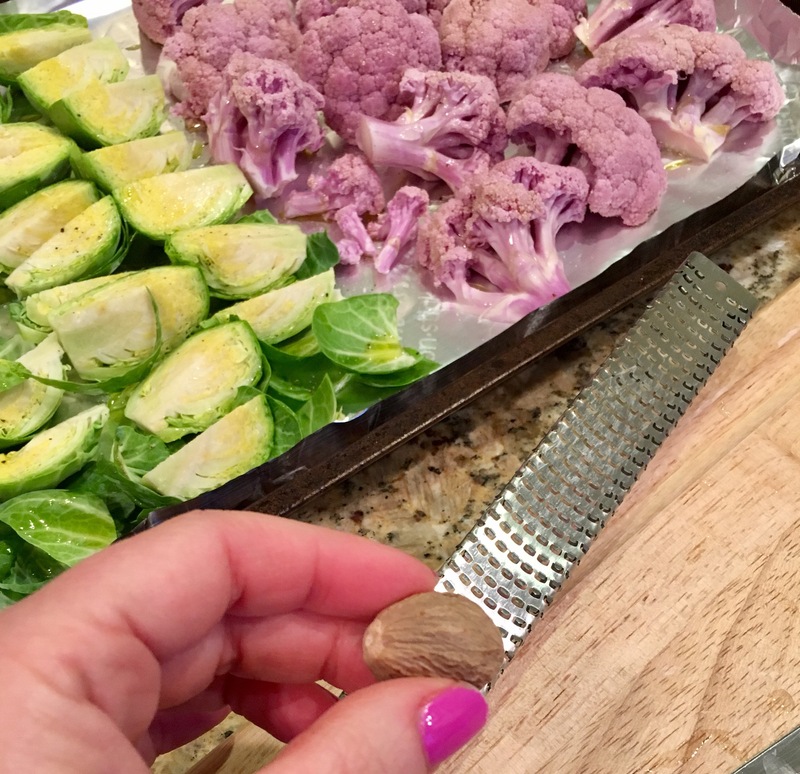 I love roasted cauliflower and brussel sprouts. They work so well together. 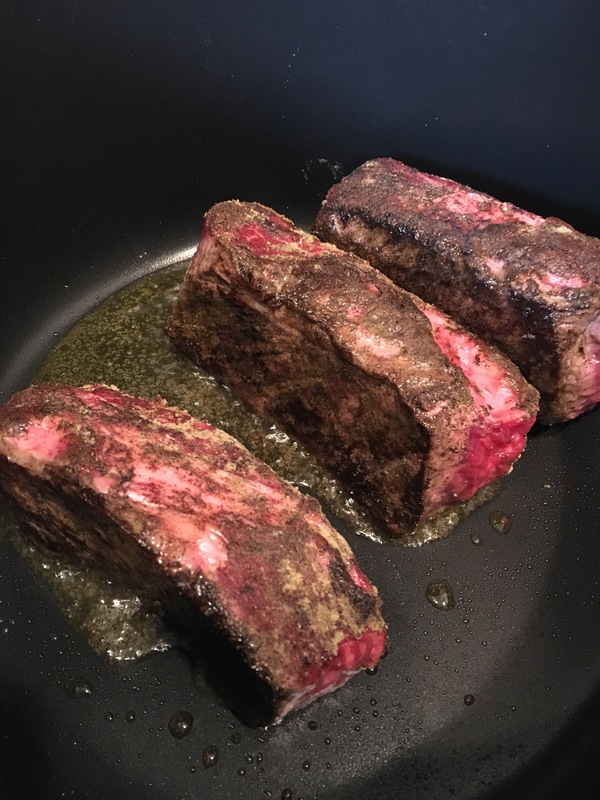 On to adding the beautiful braised short ribs!! Look how tenderly it pulls apart? No knife needed for this beef. 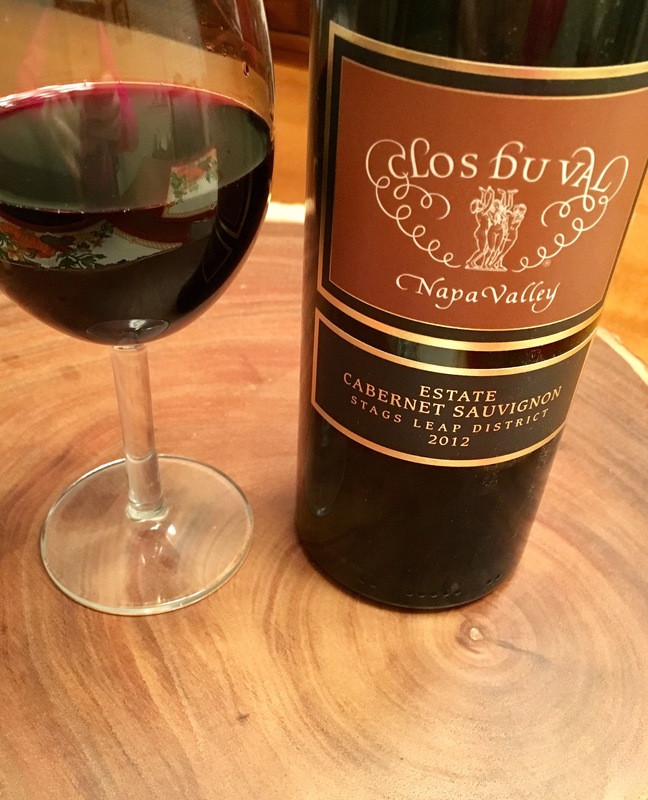 I paired this dish with an incredibly good 2012 Cabernet Sauvignon from Clos Du Val. 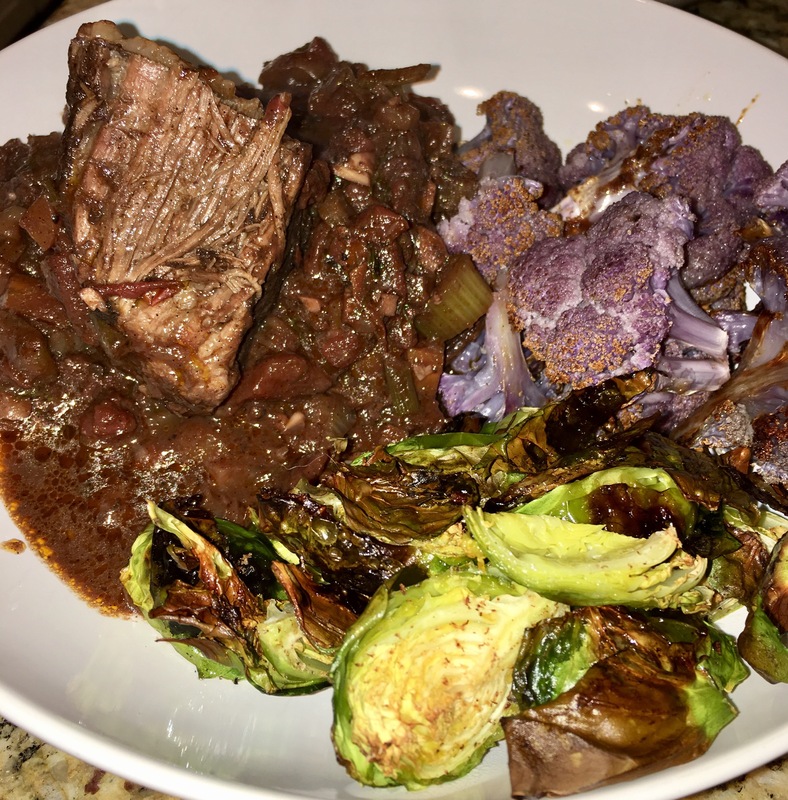 It has deep, rich, dark berry flavors with notes of chocolate and vanilla and was just perfect along side of this chocolate wine braise! OMG and shut the front door!! 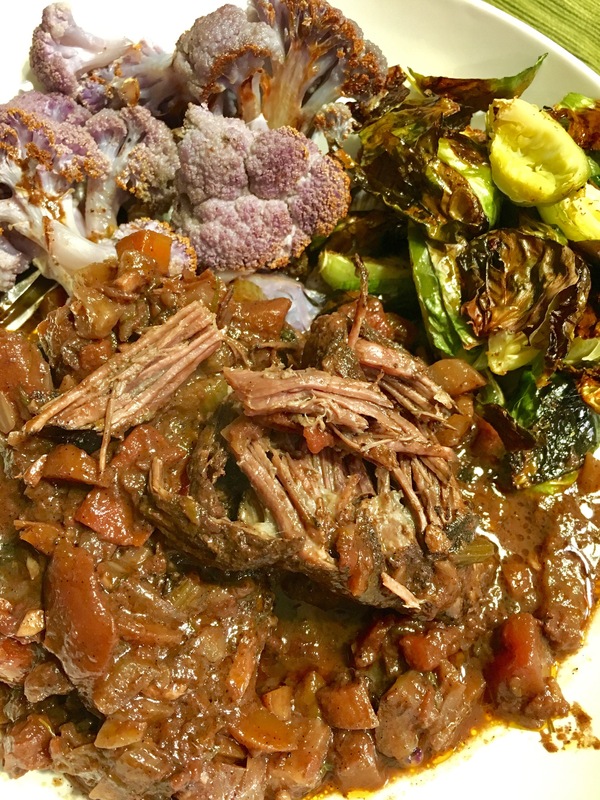 I was drooling half way into your short ribs blog today!!! 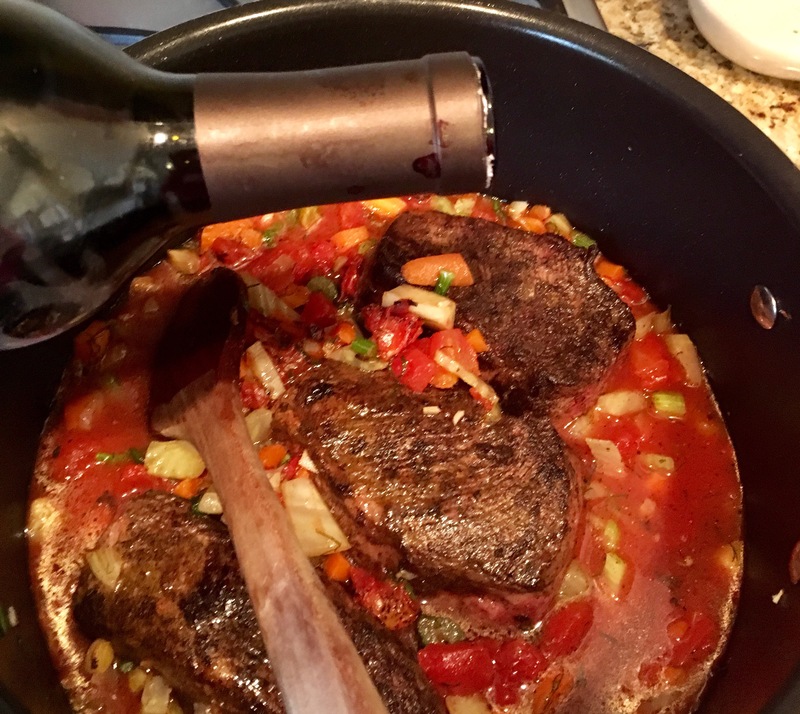 From the start of the recipe to the pairing with that elegant wine – well let me just say wow! And I love the pictures, Go Girl – and your nail color too 😘 Thank you once again, I really enjoy your blog.